d) TRAFFIC CONTROL: Traffic control in Brighton probably dates from 1900 when the police started to regulate the Clock Tower junction for horse traffic. 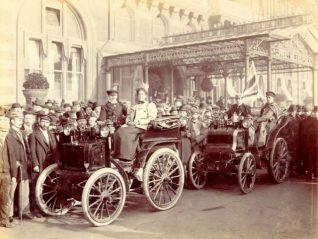 The first motor-car was seen in the town in 1895 , and the rapid growth in traffic warranted the introduction of the ‘gyratory system’ at the Aquarium junction in 1924, with a permanent island in May 1925 said to be the first roundabout in the country; two more roundabouts appeared at Preston Circus and Seven Dials soon after. One-way traffic was introduced around the Steine and Victoria Gardens in 1926. The first parking restrictions were enforced in 1934 in East Street, and on 4 March 1963 the first of 1,180 parking meters were introduced, at a parking rate of sixpence (2.5p) per hour; they are due to be replaced by a voucher system early in 1991. The country’s first pedestrian crossings, neither statutory nor marked by beacons, were painted in yellow across Madeira Drive and Marine Parade at the Aquarium in 1932. In December 1927 a police-operated mechanical semaphore signal was installed at the junction of King’s Road and West Street, said to be only the second signal of its kind in the country. It was followed by more elaborate sets at Preston Circus in 1928 and at the junction of Castle Square and Old Steine in 1929, but the semaphore signals were replaced by lights in 1933, and by 1935 there were fourteen sets operating. In October 1990 there were thirty-eight independent sets of traffic lights in Brighton, plus numerous ‘pelican’ pedestrian crossings. Lewes Road now has five sets, including two at the Vogue gyratory system, while Dyke Road and King’s Road have four.